Bluestacks is indeed a very popular Android emulator for Windows users and Bluestacks is also a very famous piece of software among Mac users to play Android games and run Android apps on Mac. It would not be wrong to say that BlueStacks was one of the first Android emulators in the industry. You can install and run Android apps and games through Bluestacks on a Microsoft Windows, Linux and Mac PC and the best thing is you don’t need to virtualize the full Android operating system and Both fullscreen and windowed modes are at your disposal. As there is a very famous saying that none of things in this world is best, Everything has shortcomings. Bluestacks’s users have to experience a lot of annoying errors and look for solutions. For example, Error retrieving information from the server, At least 2GB Physical Internal Memory despite of having 2 GB of RAM, Failed To Connect To Server, Graphic Card Error Related To BlueStack and many other errors. Today’s video is for you, If You are fed up with annoying Bluestacks errors and looking for a better BlueStacks alternative which has a relatively less number of errors than Bluestacks. 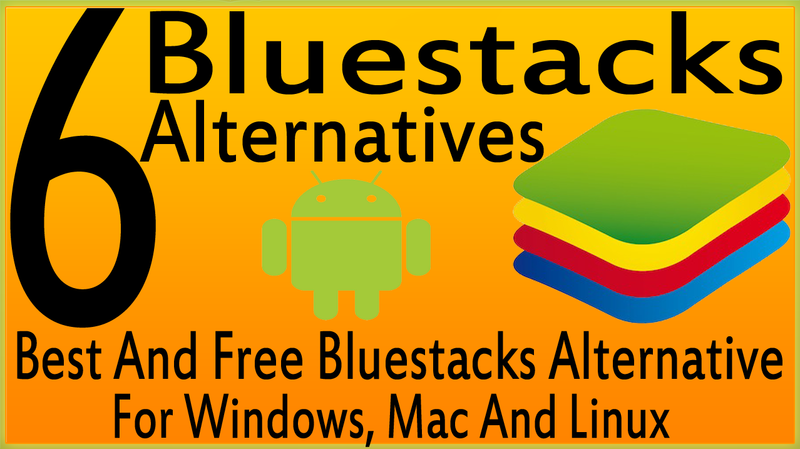 I took this into consideration and have managed to compile a list of 6 free, best and easy to use alternatives to Bluestacks to play Android games and Android apps on PC. Let’s go through the list. YouWave is a very popular Bluestacks alternative and completely paid piece of software, no freeware version except a 10 days free trial. 1.6 GHZ processor and 1 GB RAM are minimum system requirements for YouWave. Installing apps is not an easy job in YouWave and this Bluestacks alternative is only designed for Microsoft Windows users. Android x86 is very good and lightweight alternative to Bluestacks. The Android operating system can be installed on VirtualBox. Both VirtualBox and Android x86 are free to use and open source. To use this Bluestacks alternative, All you need to do is First download and install Oracle Virtualbox and then download the latest version of Android x86 to install it on VirtualBox. In addition to VirtualBox, You can use any other virtualization software such as VMware Player, MobaLiveCD and others to install the Android operating system. There is big advantage of using Oracle VirtualBox. Oracle Virtualbox is designed for Microsoft Windows, Solaris, Mac OS X, BSD and Linux operating system users. There are ton of tutorials available out there through which you can easily set it up by your own. This alternative requires less system resources than Bluestacks, You can play Android games even if your PC has 512 MB of RAM. Genymotion is another great Bluestacks alternative and this alternative is also a cross platform Android emulator and it is available for Microsoft Windows, Mac OS X and Linux operating system users. But there are two requirements I did not like. Before you use it to play Android games and run Android apps, You need to create an account on the Genymotion official website and install Oracle Virtualbox. As well as there is a separate installer is available for which you don’t need to install Virtualbox. Genymotion is free for personal use with a limited number of features while Genymotion Business version has many additional features. You need 2GB of RAM to use Genymotion. I came to the conclusion after testing Genymotion that neither Genymotion is easy to install, setup nor easy to use. You’ll have to go through a couple of complicated steps to get started. In addition to this, I experienced no annoying errors and any other complicated things. Although Andy Android Emulator is an easy to use and easy to set up Android emulator than Bluestacks. But My antivirus flagged it as a malware wile using it and I had to add it to trust list in 360 total security. My antivirus remains calm while installing it and When I go for launch it, 360 total security flags it as malware. After adding to trust list, I can use Andy Android Emulator. But on the other hand it’s very easy to set things up and easy to use, I’ve experienced no issue while using Andy Android Emulator so far. As far as system requirement is concerned, Bluestacks and Virtualbox surpass it. Andy Android Emulator requires 3 GB of RAM. Andy Android Emulator is available for Microsoft Windows, Mac OS X and Linux operating system users and andyroid.net offers it in free and paid versions. Windroye is made by a Chinese company and this alternative to Bluestacks is available only for Microsoft Windows users. There is a big headache comes packed with Windroye. The default language of Windroy is Chinese and changing it is not everyone’s cup of tea. But once you change the Chinese language to English or any other preferred language, It then becomes very easy to use. This free to use Bluestacks alternative for Windows users is very lightweight on system resources and requires 1.6 GHZ processor and 1 GB of RAM. Jar Of Beans Emulator is another lightweight alternative to Bluestacks. Though Jar Of Beans Emulator is a lightweight and free to use Android emulator but I can not say that it’s an easy to use Bluestacks alternative. Installation is easy but installing apps is too complicated. After installing apps and games, Many of apps and games crashed or became unresponsive during my test. Jar Of Beans Emulator is only available to use for Microsoft Windows users. So this was today’s list of 6 best and free Android emulator for PC that can be used as Bluestacks alternatives. 3 Android emulators for PC mentioned in the list are available for Mac and Linux users respectively Android x86, GenyMotion and Andy Android emulator while other 3 are only available for Microsoft Windows users. At the end, I do hope you liked today’s list of 6 Bluestacks alternatives, I would like to hear from you which Android emulator you use or let me know about any other good alternative to Bluestacks that I did not add to today’s list of 6 best and free alternatives to Bluestacks to run Android apps and play Android games on computer or laptop using the comment section. Do not forget to like, comment and share. Stay tuned and stay blessed.